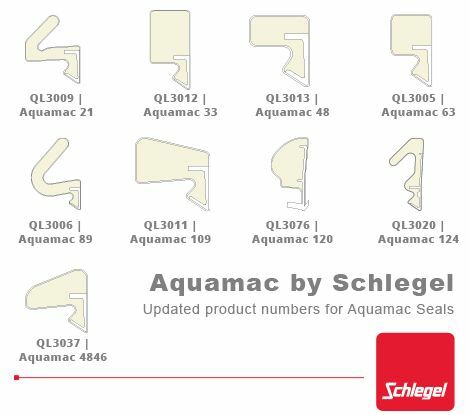 AQUAMAC by Schlegel - weatherseal for timber doors and windows. Buy Aquamac seals online here. Specifically designed for timber doors and windows, Aquamac weatherseals maintain consistently high standards of energy efficiency over their long expected lifespan. Note: Aquamac seal product codes now use a 'QL0000' format - the table below shows new and old codes..
IMPERVIOUS TO PAINT AND STAIN - reducing decoration maintenance costs. Available in 3 Colours - White, Brown or Black. Conforms to BS644 / BBA approved. Doesn't shrink or stretch, even in extreme climatic conditions. Excellent memory - retains its original shape for a consistently high standard of weatherseal. Exceptional performance maintained over a wide temperature range. High wear resistance reduces wear and tear. Immune to the effects of UV light and ozone. Lower insertion forces speed up fitting by 15%. Stays looking good for years. Aquamac is manufactured using a water repellent foam that is unaffected by rot, mould or mildew and will not freeze to mating surfaces. The Schlegel brand is now owned by ERA: there is more Schlegel product information on their website. 100m coil of Aquamac 33 seal : Schlegel QL3012. The foam is unaffected by rot, mould or mildew and will not freeze to mating surfaces. 100m coil of Aquamac 4846 weatherseal in white, brown or black. 100m coil of Aquamac 124 seal : Schlegel QL3020. Excellent memory - retains its original shape for a consistently high standard of weatherseal.